Papell with Love: Wplus9 - August Released - Lucky Stars & A Winner!!! Wplus9 - August Released - Lucky Stars & A Winner!!! 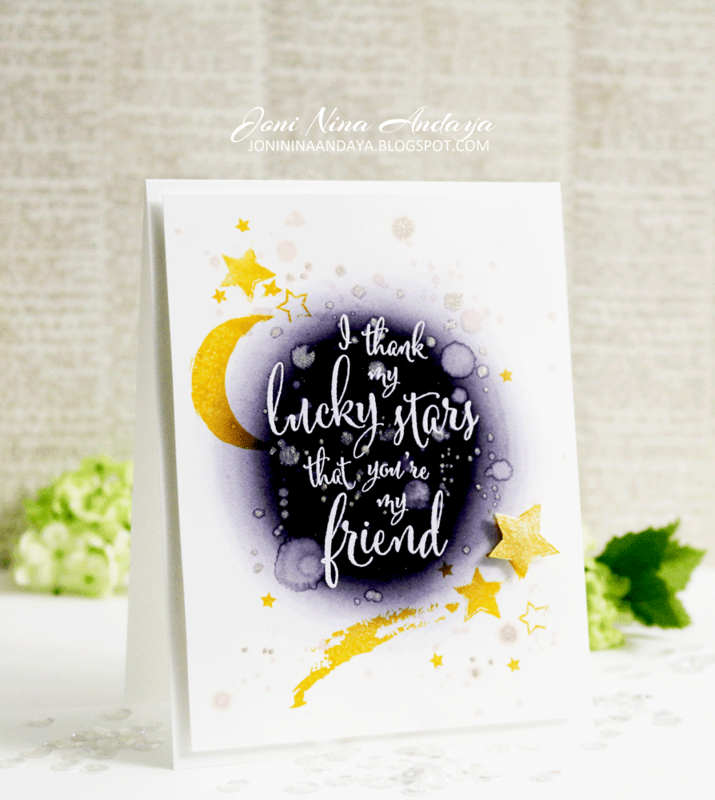 I want to share with you the LUCKY STARS stamp set. This is my version of my starry night in the sky. I first white heat embossed the sentiment, then use the True Black ink from PTI to distress the sentiment to create my dark sky. I was hoping it would be grayish black but instead it turned out blackish violet. I couldn't find my Distress Ink pad in Black Soot :(, probably lost it in our move .....*sigh* :(. Although the longer I stare at it, I think the colors are OK this way too. Sakura GELLY ROLL in Clear Star. I hope you guys enjoyed my starry night take. Thank you so much for stopping by to view my Wplus9 August 2014 Released! Shona, please email me at jonininaandaya@gmail.com so we can get these sent to you. You have until Sunday August 17th to email me. Wow ! 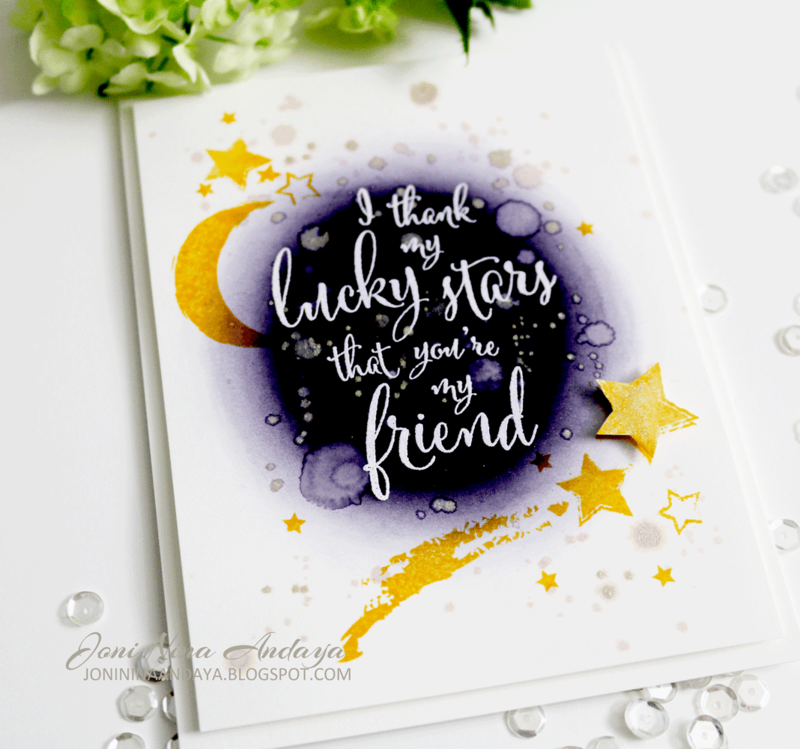 I loved the starry background and shimmer on it looks fab ! Congrats Shona ! Wow wow wow!! This is gorgeous! I loveeeeeeeeee the colors and the moon and stars!!!!!! this is so cool! love it Joni!! 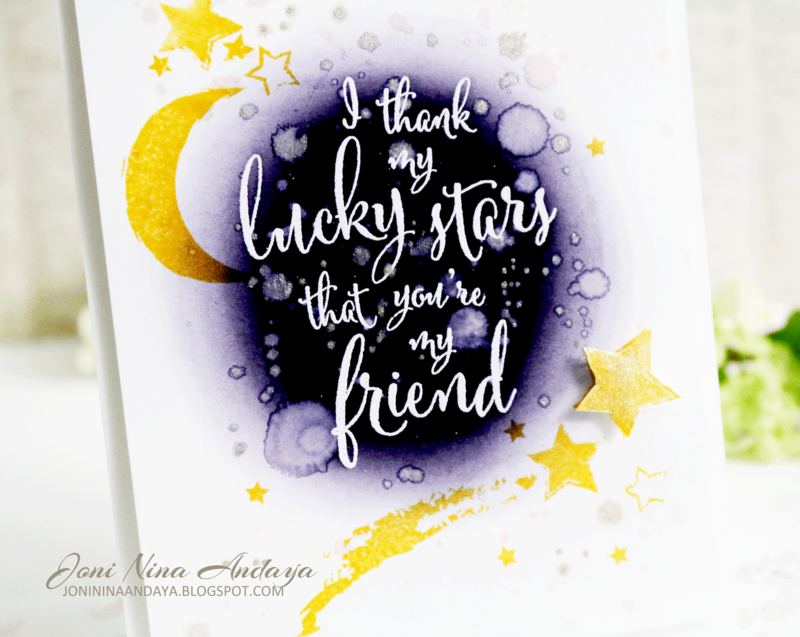 I just love this card and am glad you have the bluish black ink colour behind the sentiment ...the gel pen and the blue tinge really add so much to the beautiful card. congrats to Shona. This is so beautiful! I love the colors the way they are! This is an awesome night sky card! Love the shimmer and the purplish black! I think your card is fabulous!!!! This is amazing! Love the embossing and shimmer! Really, pretty! I love how this dark color turned out!! Looks amazing with the shimmer! Stunning card,Joni!! wow the card is amazing!!!!! Oh Joni this is a delight! I like the water spots and the shooting star! Oh, this is so gorgeous, Joni! I love it! Every detail in your card combines with every other to create a most stunning, harmonious card. Pure gorgeous! STUNNING! Love the colors and all the shimmer. The sentiment is fantastic, too. The colors are perfect for a starry night! Gorgeous! So beautiful and amazing card!! All your cards are AWESOME! Wow. This card is absolutely stunning! LOVE it!! I actually think the violet hue really did your card justice! !